Popular footwear and fashion retailer gravitypope is contemplating expansion, and is particularly interested to expand with a larger 'lifestyle store' concept. Opportunity could occur in existing markets that it serves, as well as eventual expansion into new Canadian cities. We interviewed gravitypope's founder and owner, Louise Dirks, to learn more. gravitypope (spelled lowercase) was founded in 1990 as a single shoe store on Edmonton's trendy Whyte Avenue. In the mid 1990's, it expanded its offerings to include designer ready-to-wear. gravitypope opened a location on Calgary's fashionable 17th Avenue S.W. in the year 2000 and in 2004, a Vancouver location opened on West 4th Avenue in the popular Kitsilano area. Inside Vancouver's gravitypope Tailored Goods. gravitypope's well-curated designer clothing section became so popular that it soon warranted its own free-standing stores. In 2007, two ready-to-wear clothing boutiques, called gravitypope Tailored Goods, opened in Edmonton and Vancouver. Vancouver's Tailored Goods is located next to gravitypope's footwear boutique, while its Edmonton location is two blocks east of its footwear shop, on Gateway Boulevard. In late 2012, gravitypope opened its largest location on Toronto's hip West Queen West. Carrying footwear, clothing, accessories and apothecary, the store spans about 4,000 square feet of retail space, as well as an additional 2,500 square feet for storage. The two-level store features a 2,700 square foot ground floor devoted to footwear, and a 1,400 square foot mezzanine for men's and women's clothing. We spoke with gravitypope founder and owner Louise Dirks, who gave insight into the retailer's expansion plans. Ms. Dirks would like to eventually operate a collection of larger 'lifestyle stores', merging hard to find, quality collections of footwear, clothing, accessories, an apothecary and if the footprint permits, even on-site coffee shops. Each of these stores would ideally be in the 8,000 to 10,000 square foot range. Ms. Dirks says that gravitypope could very well expand into other Canadian cities. The first city to possibly see a new store would be Montreal, as Ms. Dirks has received numerous email requests from locals. gravitypope will first focus its growth on current markets, however, merging footwear with fashion, and possibly coffee. 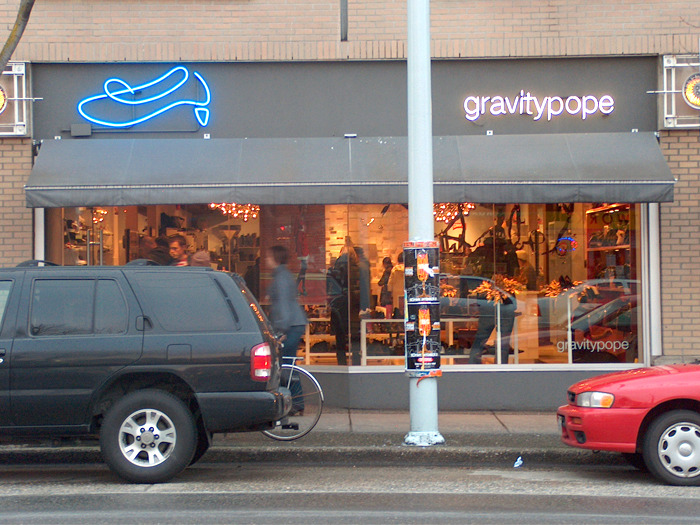 Vancouver, for example, could see a second gravitypope store -- this time, a flagship lifestyle location. Ms. Dirks says that she'd ideally like it to be on Vancouver's tony South Granville, and that she'd also keep her current locations nearby on West 4th Avenue. Ms. Dirks says that gravitypope does exceptionally well in Vancouver, though its sales are limited due to the relatively small size of its storage area. gravitypope currently occupies just under 5,000 square feet in Vancouver, including an 1,800 square foot footwear store, an 1,800 square foot clothing store, and ancillary storage space. The Edmonton footwear flagship measures 1,800 square feet, and gravitypope leases almost the entire Whyte Avenue building in which it is contained. Three above-ground levels are all leased by gravitypope, housing storage, offices, and e-commerce-related activities. gravitypope recently opened an outlet store at West Edmonton Mall. Located on Europa Boulevard, the outlet is adjacent to British footwear retailer Doc Martens. Ms. Dirks is also Doc Martens' Edmonton franchisee. Inside Edmonton's gravitypope Tailored Goods. gravitypope carries a mixture of trendy and luxury labels in its stores, as well as a new private-label footwear brand, currently accounting for between 8% and 10% of sales. Popular Spanish-based footwear brand Camper is Gravitypope's number one selling brand, and it carries other footwear brands such as Alexander Wang, Cydwoq, Coclico, Chie Mihara, Church's (owned by Prada), Comme des Garcon PLAY, Fiorentini & Baker, Isabel Marant, John Fluevog, Jil Sander Navy, John Varvatos, Moma, Repetto, Veronique Branquinho, and many others. Clothing designers such as Band of Outsiders, Carven, Filippa K, Maison Kitsune, Marni, Moncler, Paul Smith, Rag & Bone are featured. An impressive roster of accessories designers and apothecary are also featured, and all designers are listed on Gravitypope's website. Ms. Dirks says that, moving forward, any new stores will be streetfront locations, as opposed to stores within shopping centres. It's a personal preference for Ms. Dirks, especially given gravitypope's tremendous success with its current streetfront locations. Ms. Dirks says that gravitypope's sales are growing year-over-year. Besides its productive brick-and-mortar locations, gravitypope also enjoys a robust e-commerce business, with online sales now accounting for over 10% of sales. We'll be sure to keep you updated on gravitypope’s store expansion. *All photos are via gravitypope's website.